What is WWW Wednesday? It is a thing from Should Be Reading that asks the following questions. Post your answers in the comments (or a link to your blog post containing the answers). 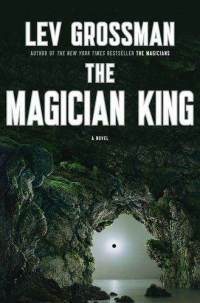 Right now I’m about to finish up The Magician King by Lev Grossman. It is the sequel to The Magician, which I didn’t realize until I was already hooked. Fortunately, it doesn’t detract from the story. All it did was entice me to read The Magician. Hopefully, I’ll have that one wrapped up before the week’s out, so I can review it for you. I finished reading Gone Girl by Gillian Flynn and Allegiant by Veronica Roth last week. This entry was posted on Wednesday, April 30th, 2014 at 2:21 pm	and posted in Uncategorized. You can follow any responses to this entry through the RSS 2.0 feed. « Would You Rather Be Superman or Batman?